The new HyperDeck Extreme 8K HDR features the trusted reliability of HyperDeck combined with new innovations such as space saving H.265 files, optional internal cache, 3D LUTs, native 8K and HDR support. With the ability to record native 8K in H.265, you get reduced storage costs and amazing image quality. The large touch screen ensures a perfect view of your recording as well as control over all deck settings. You can then add HyperDeck Extreme Control to transform it into a traditional broadcast deck. This means HyperDeck Extreme is the perfect solution for the next generation of broadcast, live production and digital signage. HyperDeck Extreme has an innovative touch screen user interface with deck controls as well as a large screen to view your recording. Then add a HyperDeck Extreme Control for traditional broadcast deck controls and a large shuttle knob that feels incredibly luxurious to use. You can even rack mount the HyperDeck and the controller. 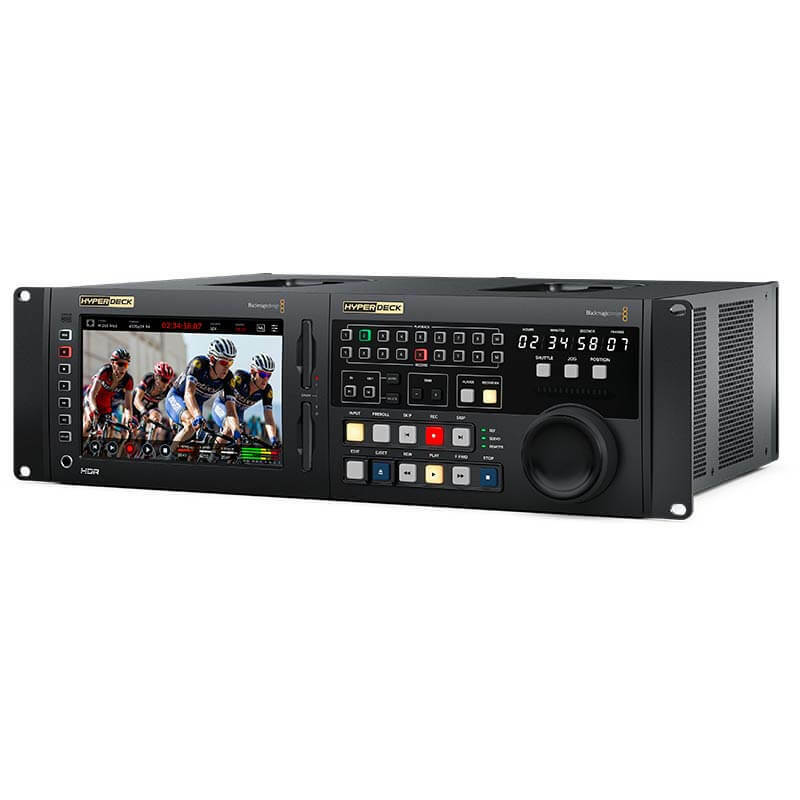 HyperDeck Extreme also includes 2 media slots, Quad 12G-SDI for 8K, analogue connections for archiving, USB‑C external disk recording, plus a front panel speaker and headphone jack. There's also an optional cache that eliminates dropped frames if your media becomes full or is too slow. Both AC and DC power connections are also included for studio or on location use. With its amazing versatility, HyperDeck Extreme is also great for live production as a master recorder, clip player and for recording ISO cameras. The analogue inputs allow you to record from old video tapes, so legacy programming can be used on the latest streaming services or for use in editing. Digital signage in 8K is easy with HyperDeck Extreme as it has 10G Ethernet for fast media uploads, plus it features a simple remote control protocol. 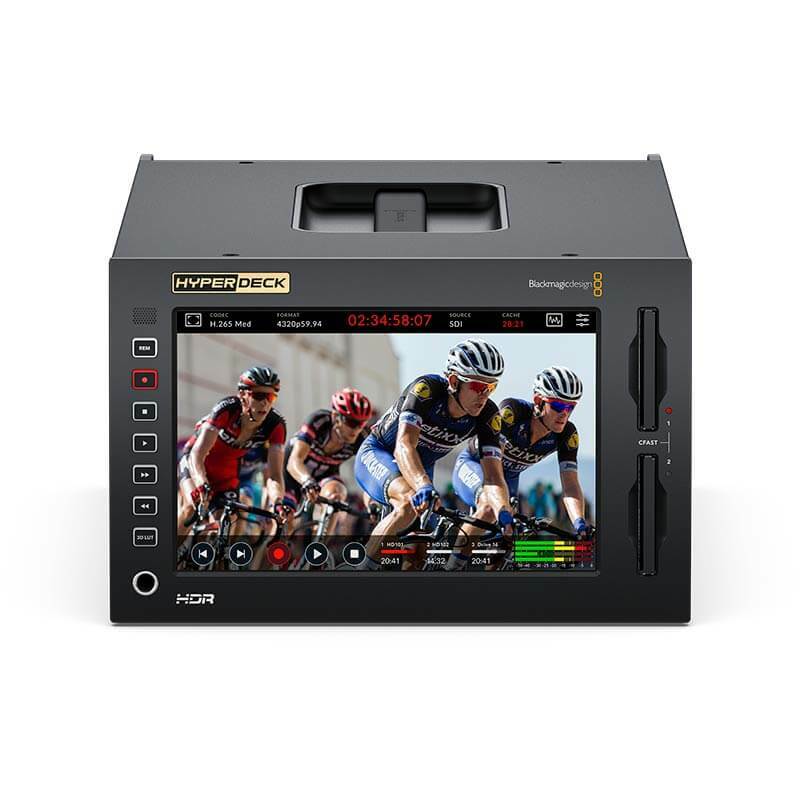 You can even use it as a field recorder as it includes HDMI, SDI and analogue inputs with built in scopes and 3D LUTs. The scopes also help you QA masters to ensure compliance with broadcast standards before streaming and broadcast. The latest Quad Link 12G-SDI is included so it’s possible to record and playback in full resolution 8K for amazing quality. The SDI connections are multi-rate, so you can use Quad Link 12G-SDI to get compatibility with other 8K products, or switch to SD, HD or Ultra HD using the single link 12G-SDI connection. To allow regular CFast cards to be recorded at high resolution 8K, HyperDeck Extreme uses modern H.265 files for 8K recording and playback. This means HyperDeck Extreme 8K is perfect for connecting to the latest 8K televisions and projectors. 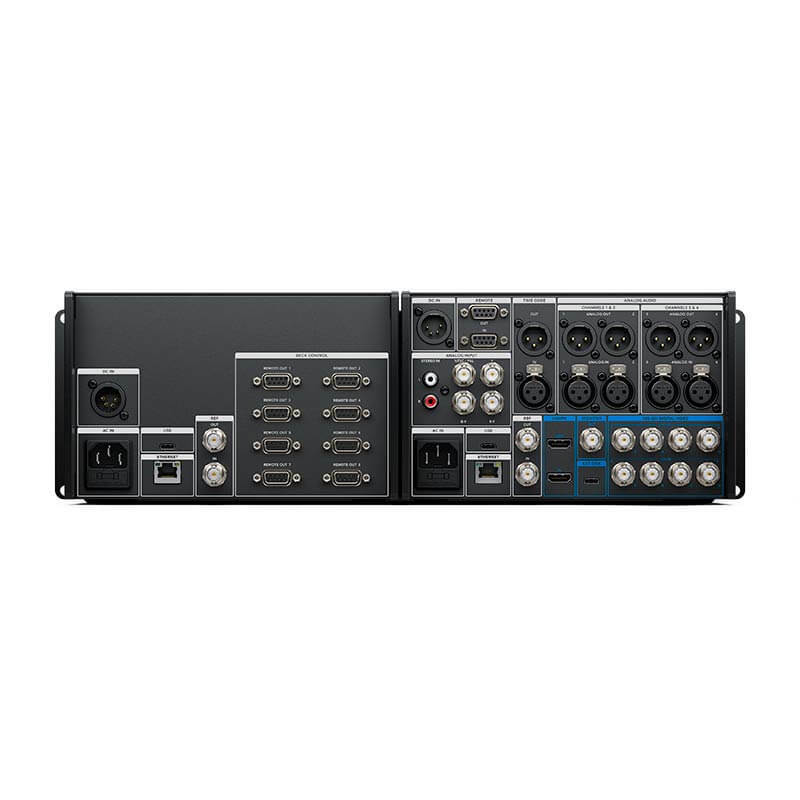 Plus it’s also the perfect solution when using ATEM switchers. With 8K broadcasting already happening in Japan now, you're ready for an 8K future. The innovative touch LCD user interface provides incredible control. On screen, there are dedicated buttons for play, stop and record, plus a mini timeline for scrolling through your recordings. You can even image swipe to jog. 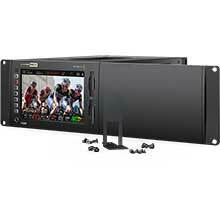 The LCD includes a heads up display of timecode, video standard, media status as well as audio meters. Scopes can be enabled via the touch screen as well as focus and exposure assist. There's also an extensive range of settings all controlled from the large LCD. Plus you can load and save 3D LUTs. You also get direct buttons for transport control, enabling the 3D LUT and remote enable. Then you can always add traditional deck controls with HyperDeck Extreme Control. CFast media support allows you to record to commonly available flash memory cards. The H.265 files are small enough to allow long recordings on standard CFast cards. Plus there are 2 CFast card slots so you can swap out any full cards even during recording, allowing infinite length recording. CFast cards are perfect for broadcast because they are small, high speed and affordable. You can even use a Blackmagic MultiDock 10G to add SSD compatibility. With H.265, you can record 498 minutes at 8Kp60 on a 1 TB card, 1,059 minutes in 2160p60 Ultra HD and 2,354 minutes in 1080p59.94 on a 1 TB card. That’s over 8 hours in 8K and over 39 hours in HD. If recording to other media types is required, then the USB‑C Expansion port lets you plug in an external flash disk for recording. USB‑C flash disks have massive capacity as they don't suffer from any size constraint. Plus, it’s possible to record to the same disk you are using or editing, so you don't need to waste time copying files before starting post production. Flash disks are so fast, they can record high data rate formats that are too big for CFast cards, such as real time ProRes in 8K. 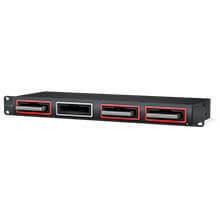 Adding a Blackmagic MultiDock 10G also makes it easy to use SSDs for compatibility with other HyperDeck models. You even get on screen menus for managing external disks using the touch screen. 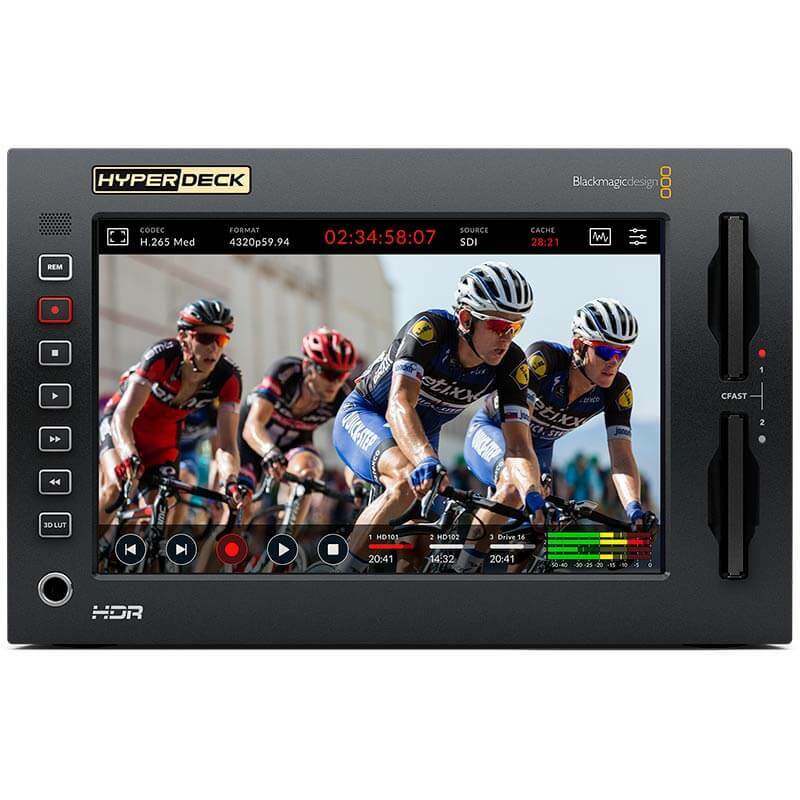 HyperDeck Extreme 8K features a wide range of video and audio connections such as multi-rate Quad Link 12G-SDI for SD, HD, Ultra HD and 8K SDI devices. The 12G-SDI outputs support fill and key when playing RGBA 4:4:4:4 files. HDMI is included for consumer televisions and video projectors. For archiving work, HyperDeck also includes both balanced analogue, HiFi audio plus timecode connections. For monitoring there's even a down converted monitor SDI output that includes overlays. The USB‑C connection lets you plug in flash disks or disk arrays for recording. The latest 10G Ethernet is included for high speed upload using FTP protocols. 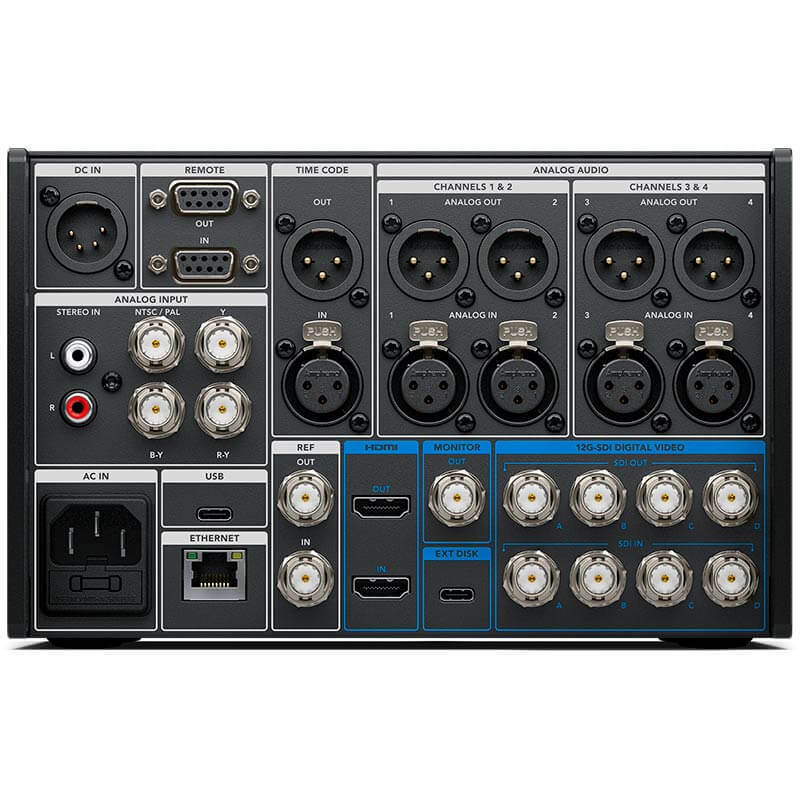 HyperDeck even includes both AC and XLR 12V DC power connections. You'll be ready for the latest HDR workflows with support for the latest HDR standards and an extremely bright screen with a wide colour gamut. The built in scopes even change to HDR scopes when working in HDR formats. Files are tagged with the correct HDR information then SDI and HDMI inputs will also automatically detect HDR video standards. Static metadata PQ and HLG formats are handled according to the ST2084 standard. The bright LCD has a wider colour gamut so can handle both Rec. 2020 and Rec. 709 colourspaces. The built in HyperDeck Extreme 8K HDR LCD colour gamut can even handle 100% of the DCI‑P3 format. HyperDeck Extreme features full internal waveform monitoring so you can ensure compliance to broadcast standards when used on high end work. The waveform display provides a traditional luminance (brightness) levels view of your input or playback signal. The vectorscope display allows you to see the intensity of colour at 100% SDI reference levels. You also get RGB and YUV parade displays which are ideal for colour correction and checking for illegal levels. Histogram shows the distribution of white to black detail in your images and highlights or shadows clipping. The built in scopes can be overlaid on live video, or as a small picture in picture view at the top right of the scope. HyperDeck Extreme 8K HDR includes professional audio for modern broadcasters or archiving from older broadcast decks. When working in SDI formats, you can record 2, 4, 8 or 16 channels of audio in real time. For capturing legacy programming there are 4 XLR analogue audio inputs that let you record all 4 channels from Betacam SP decks. You can monitor using 4 on screen audio meters with user selectable VU or PPM ballistics. For consumer devices such as VHS, DVD and set top boxes, there are also direct HiFi audio inputs. 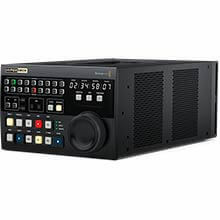 HyperDeck Extreme 8K HDR might be the latest in 8K technology, however the analogue connections have also been designed to low noise and low distortion broadcast specifications. Multiple languages are fully supported so you don't need to learn another language to use it. Support is included for English, Chinese, Japanese, Korean, Spanish, German, French, Russian, Italian, Portuguese and Turkish. At first start, HyperDeck Extreme 8K will display a menu for selecting a language, plus you can still use the menus to change languages any time you need. When a language is selected, the on screen text overlays will change, as well as all menus and the overlays on the SDI monitoring output will also be displayed with the selected language. All this means HyperDeck is perfect for doing international location work with different crews. With 10G ethernet, HyperDeck Extreme 8K HDR is perfect for digital signage because remote uploads are extremely fast. What's amazing is the ethernet uploads on HyperDeck Extreme 8K HDR are much faster than CFast card transfer speeds. All models use an easy text based protocol plus you can use Telnet to test control commands. Simply log into HyperDeck and then type "play" or "record" and it will execute the command. It's that simple. To upload media files remotely, you can use FTP, or even use simple FTP client software. When the ethernet protocol and FTP is used with large USB‑C disk arrays, HyperDeck Extreme becomes a great broadcast server for ingest, media management and playout. 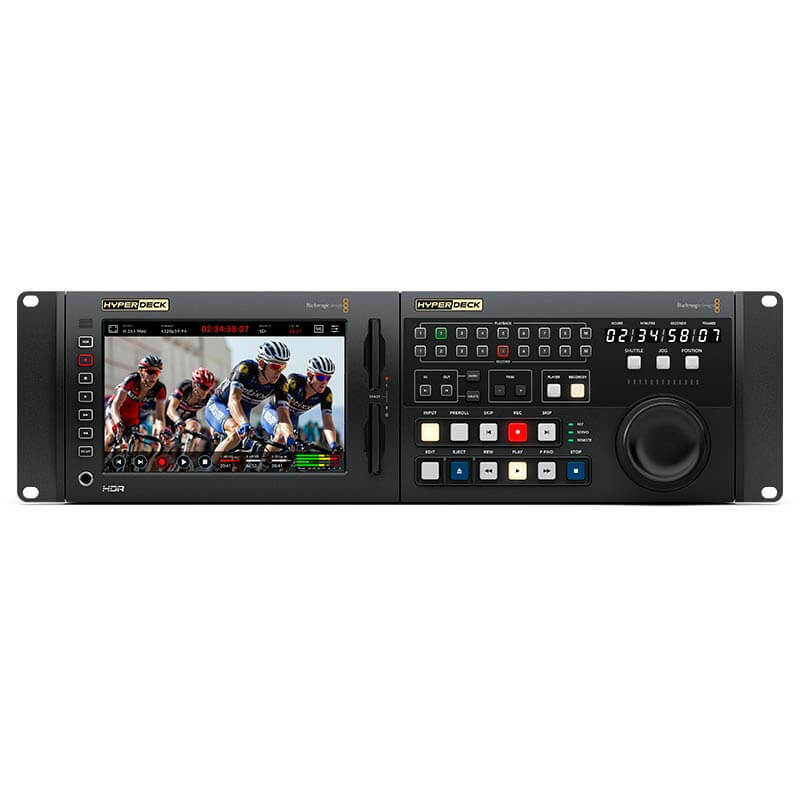 There's a wide range of Blackmagic Design products you can use with HyperDeck Extreme, including the HyperDeck Extreme Control for adding traditional broadcast deck controls. Plus it uses the industry standard RS‑422 deck control protocol so it works with any broadcast deck. Add the new Blackmagic MultiDock 10G to use regular SSDs for compatibility with media from other HyperDeck models. HyperDeck Extreme 8K is also a perfect mastering recorder with the new ATEM Constellation 8K, or for clip playback and ISO reordering. 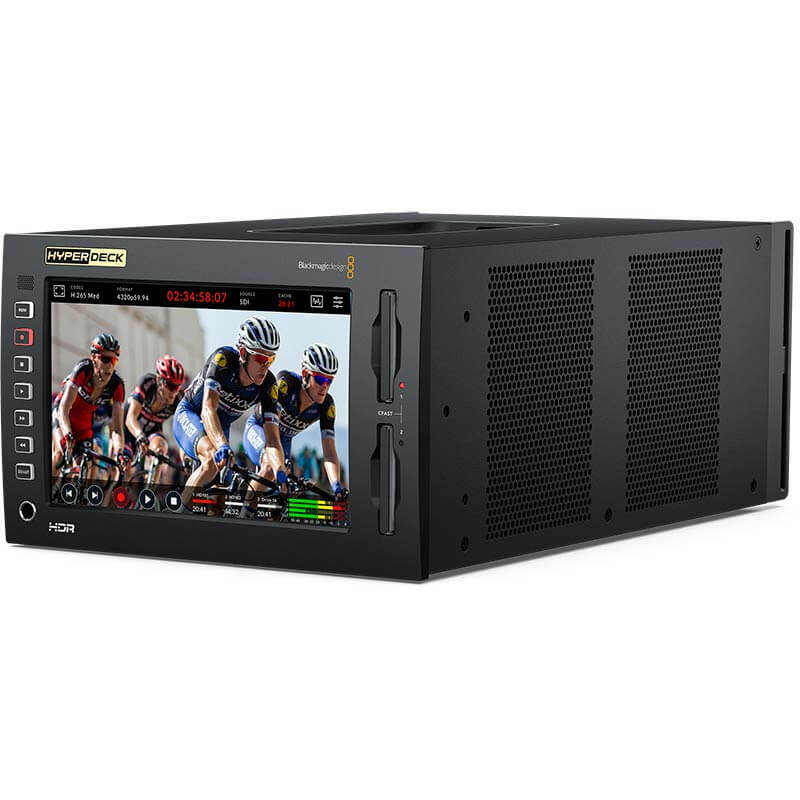 For monitoring, the Teranex SDI to HDMI 8K allows broadcast monitoring on a television and it also has monitor calibration, 3D LUTs and on screen scopes. The files from HyperDeck Extreme 8K are common so they are compatible with all operating systems or in most video software. Media can be formatted using ExFAT or HFS+ so you can easily access the media on computers and access the files like regular disks. DaVinci Resolve is perfect for use with HyperDeck because it features editing, colour correction, audio post production and visual effects all in one software application. Plus you can download DaVinci Resolve free of charge for Mac, Windows and Linux. You can also use recorded files in other popular software such as Premiere Pro and Final Cut Pro X. With HyperDeck, your media is common so your files will remain readable in the future.